Boating was painted in the summer of 1874 when Manet was at the family home at Gennevilliers on the Seine, opposite Argenteuil. At this time he was frequently joined by Claude Monet, who had been living in Argenteuil for some time, and occasionally by Renoir. Manet painted Monet and his wife and it was at this period that he came closest to adopting the impressionist idiom of working in the open air, using short rapid brushstrokes and adopting a much higher key than in his earlier work. 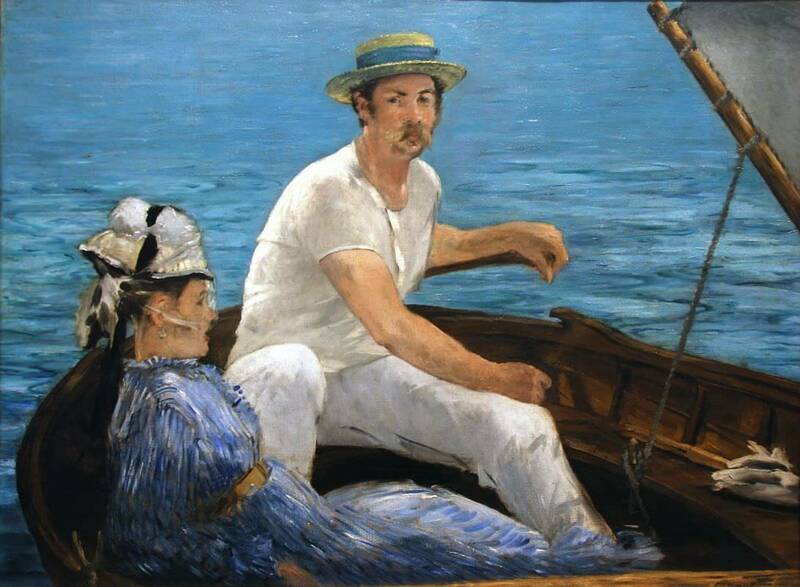 This painting however is in many ways still tied to Manet's traditional practice. It is much larger than the portable canvases Monet and Renoir were using at this time and this would suggest it was done in the studio. Similarly, there is none of the apparent spontaneity that characterized impressionist works of this period, particularly in the rather contrived nature of the composition, which owes much to careful planning and is closest in spirit to Japanese prints. The work was shown at the Salon of 1879 where its affinities to Impressionism were noted by a number of critics.